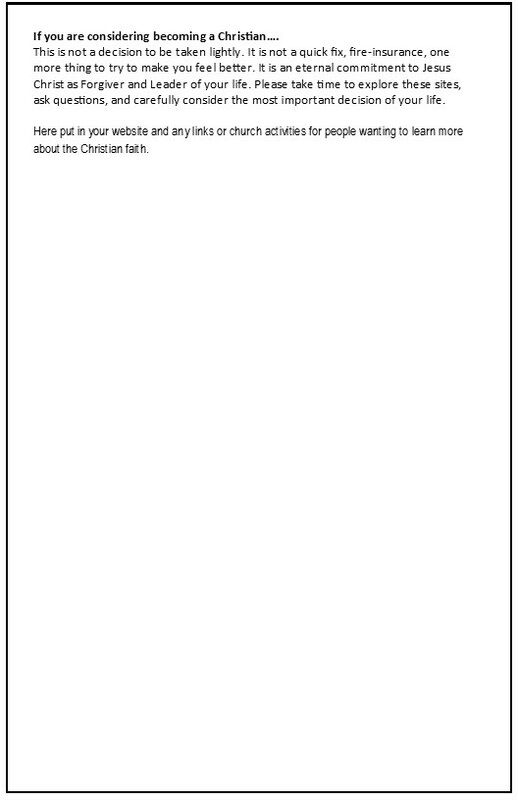 Following are images of the templates that we have. This is more traditional, but still very important. 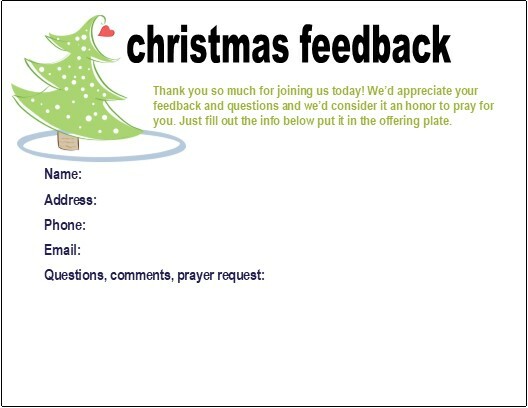 It's important to connect with people who come to special Christmas services so you can follow-up with them. Again, we are always very clear about why we are doing this—we want to stay in touch. 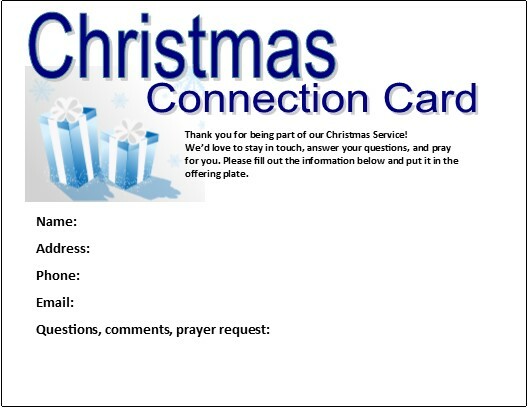 One strategic, but very honest way to encourage more people to turn them in is to remind them that you are not only asking for connecting information, you also would like to give them the gift of praying for them this holiday season. Though it's a time of festivities and fun, it's also a stressful and sometimes lonely time for many. 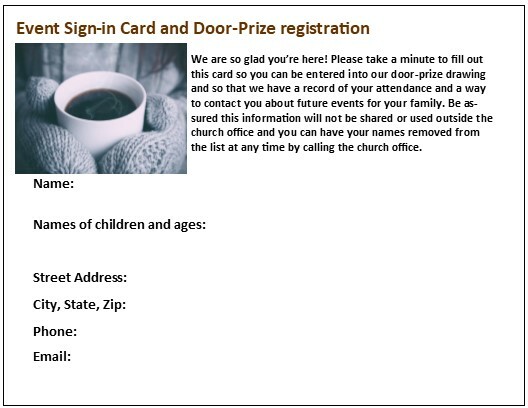 This connection card may give you the opportunity to significantly minister to guests and members. 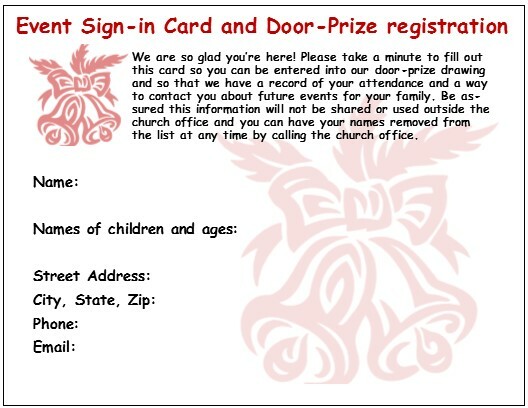 To show them that you mean it, when you mention the card actually pause to give them time to fill it out. 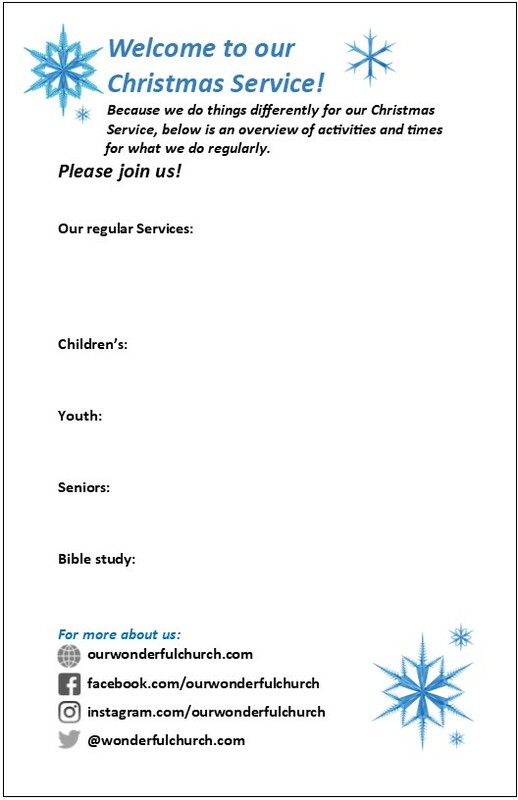 Thank you for being part of our Christmas Service! 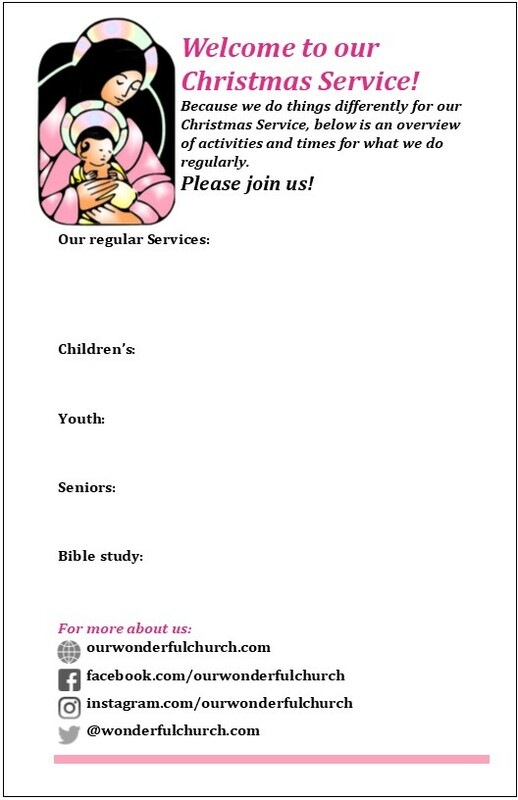 We’d love to stay in touch, answer your questions, and pray for you. 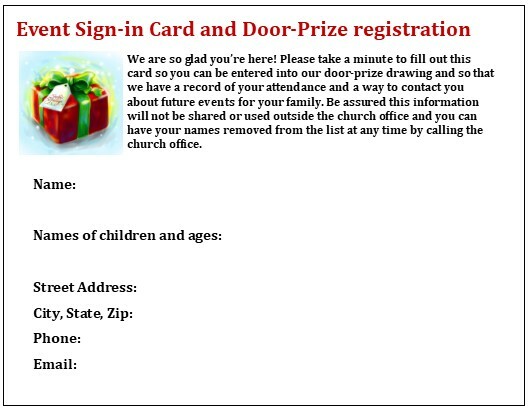 Please fill out the information below and put it in the offering plate. May your Christmas be joyful! If your holiday is partly ho-hum instead of ho, ho, ho—we'd like to let you know you aren't alone. 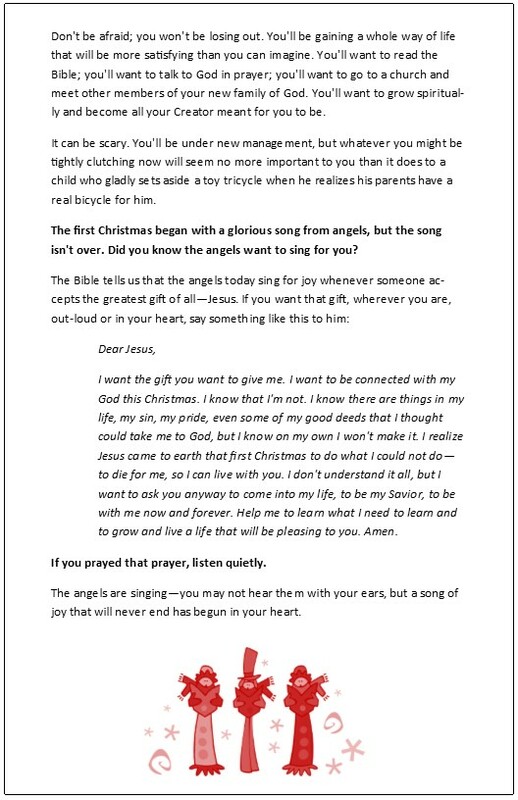 I imagine that first Christmas wasn't totally happy for the parents of Jesus when you honestly think about. We'd like to pray for you. 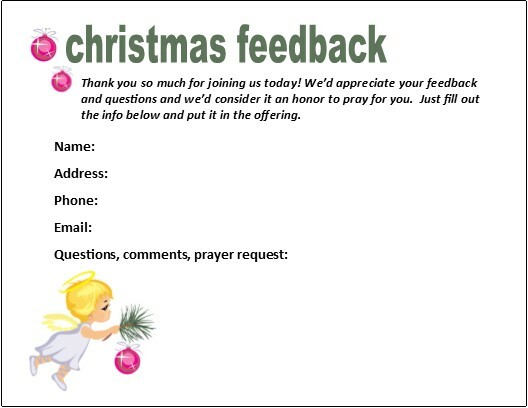 Please let us know what to pray, our prayers will be our gift to you. I don't remember what holiday it was, but the church where my husband was the Single Adult Pastor held a lot of big community events. We were a large church and it wasn't easy to keep track of people. 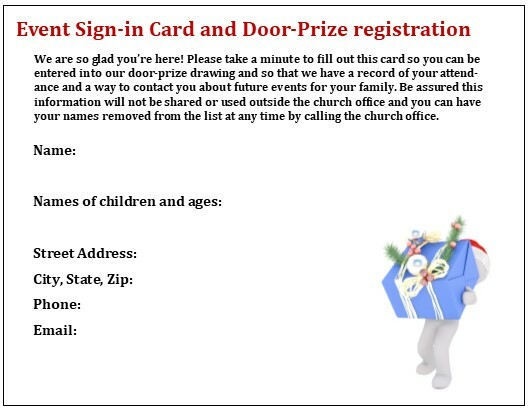 I started a conversation with a woman who told me she was a single mom and she and her kids came every year to the various things the church put on. 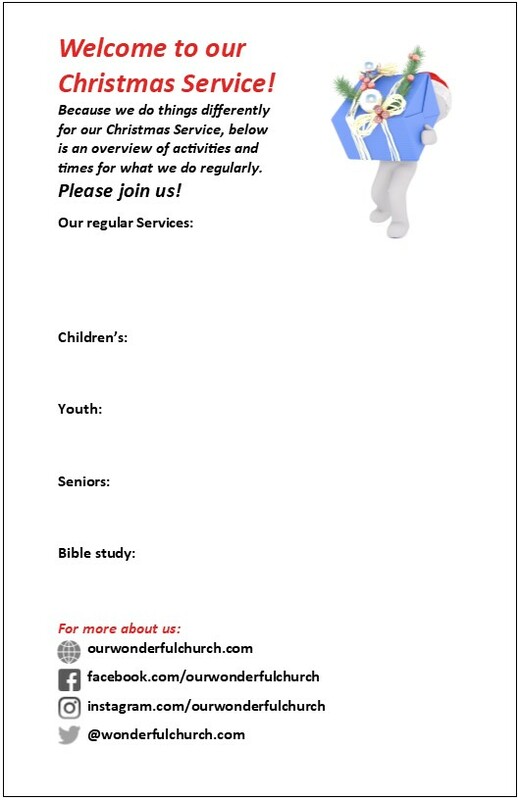 Because I didn't remember seeing her in our Single Adult Ministry, I asked her what service she regularly attended. "Service?" she said, "what do you mean by service?" "You know, the things we do regularly on Sunday," I replied. "You do things on Sunday?" she said, "I thought you guys only put on special events every few months." 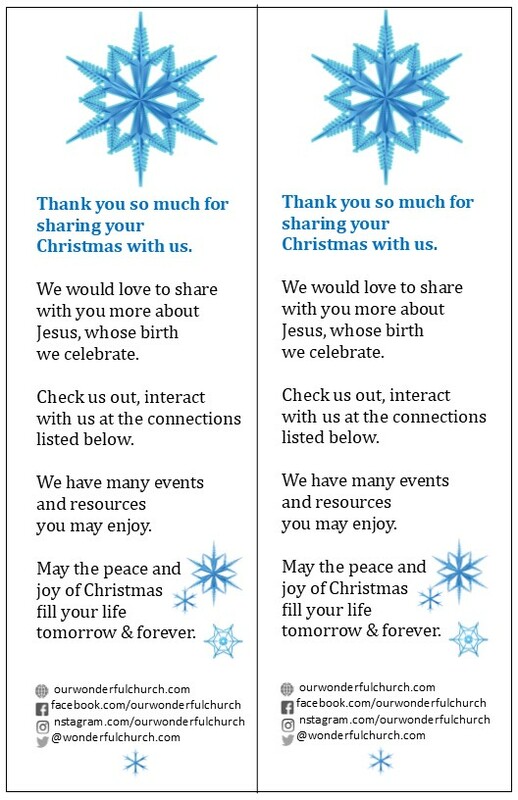 That's when I started creating communications about "What we do regularly" to give out to guests. Though it's hard to imagine a member of the community around your church not knowing what the church did on Sunday, it shouldn't be. 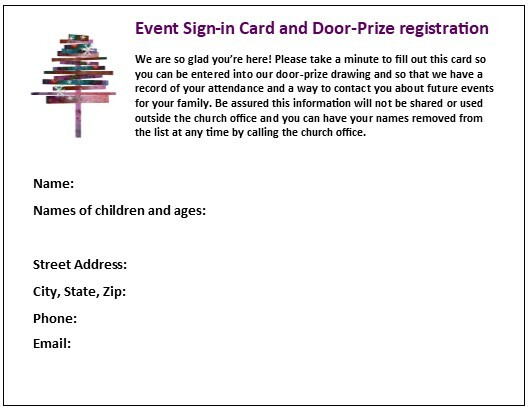 If you didn't grow up going to church and many people in our communities didn't, they have no idea what a church does regularly, what time it meets or why they should bother to attend. 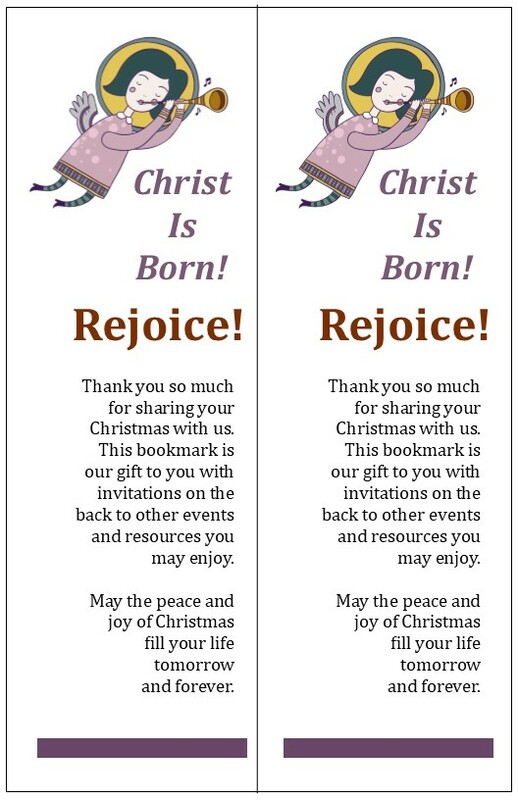 Below are bookmarks and flyers that you can adapt to let them know. You can also take this basic information and put it into digital or social media format if that's the primary way you follow-up with guests. 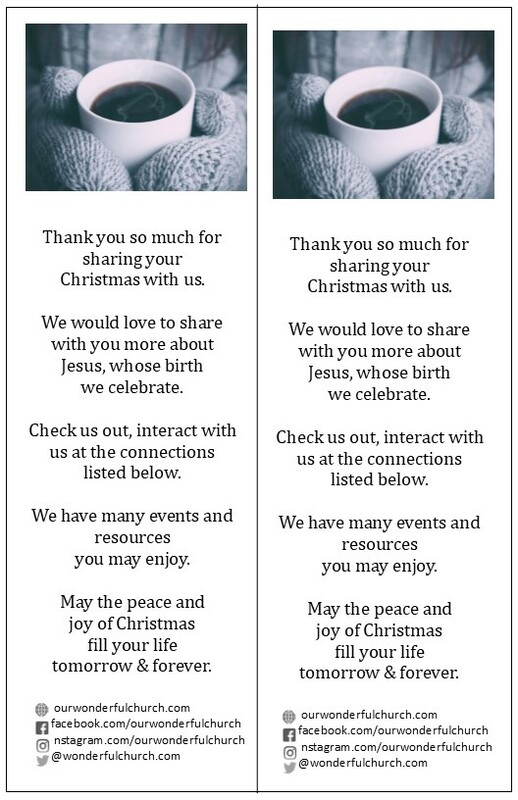 If you do a print piece like the ones below have the social media links for people to find out more about your church and invite them to interact with you if they have questions. 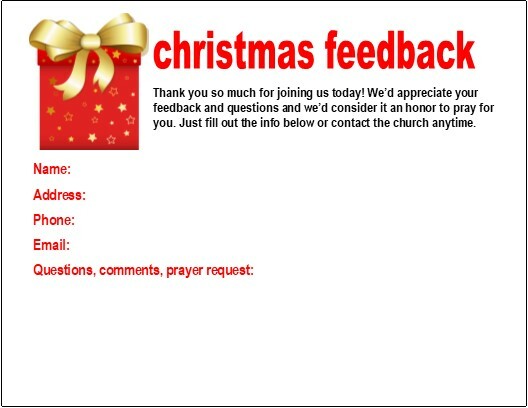 At some time during the service be sure to point out the communications and to personally invite people back. We don't celebrate the birth of Jesus because he was an exceptionally cute baby. We celebrate it because it was the start of a life that would end with his death as a sacrifice for our sins. 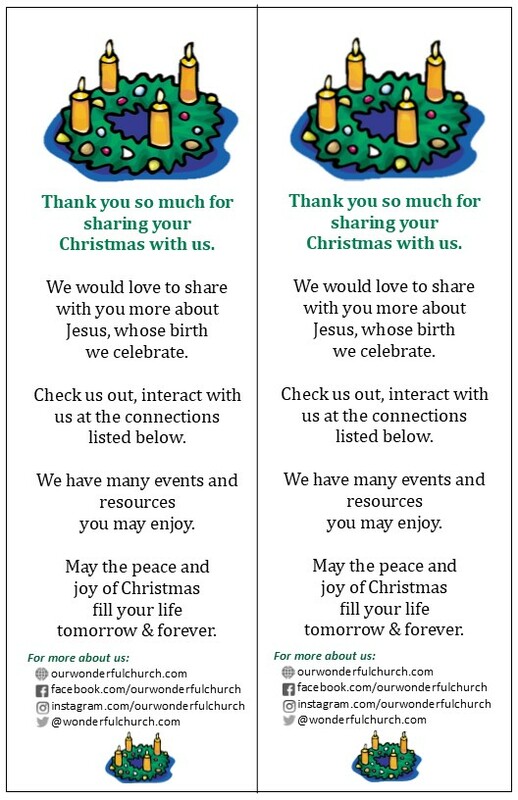 We may not be able to tell the whole story at our Christmas events, but we should give people something to let them know there is more. Following I have two ways to do that. 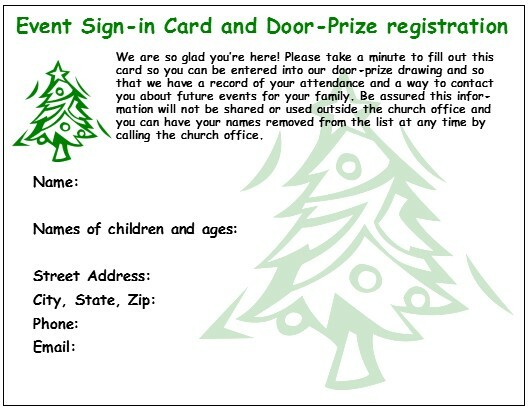 First is a card that you can either send as a follow-up or include in your Christmas program. You can also take out the text and use it anywhere. Second is a longer piece that can either be a bulletin insert or again, you can use the text anywhere you want. 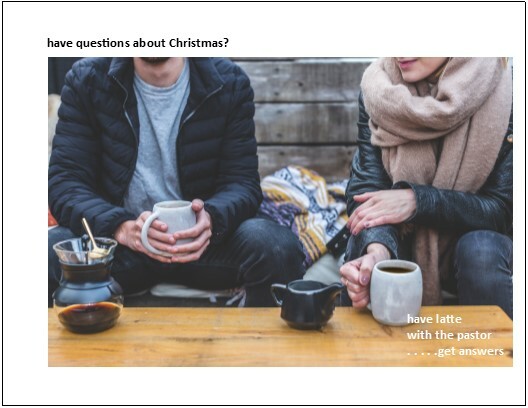 One more thing—I know everyone is very tired—but consider question and answer times, a study for spiritual questions, or some other interactive event to invite guests to after Christmas. 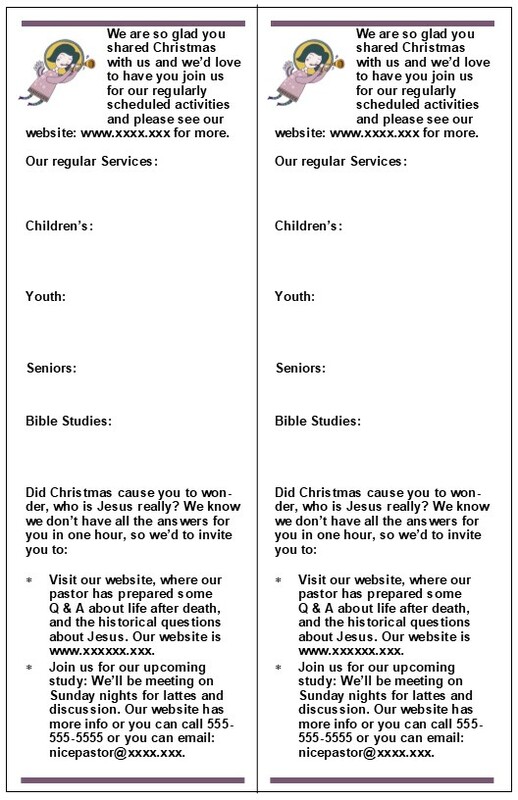 You can also link to videos or other information on your website or have something that explains Jesus life and offer of salvation. 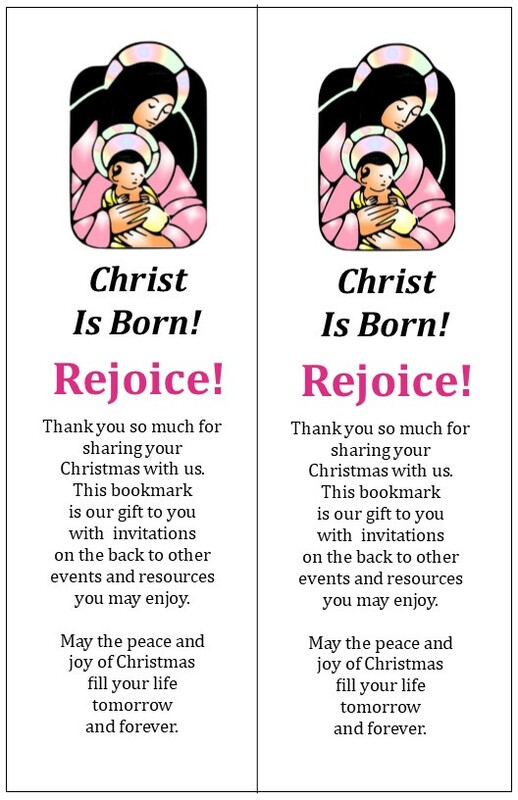 Here are the templates that we have and below them a link to download them. 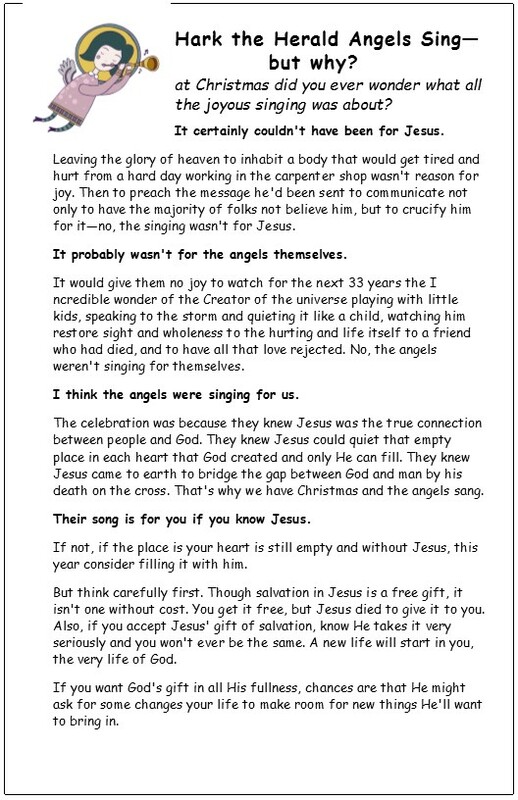 Quarter-page, Postcard size "Because He didn't stay a baby"
Because he didn’t stay a baby. . .
we want to tell you the rest of the story. 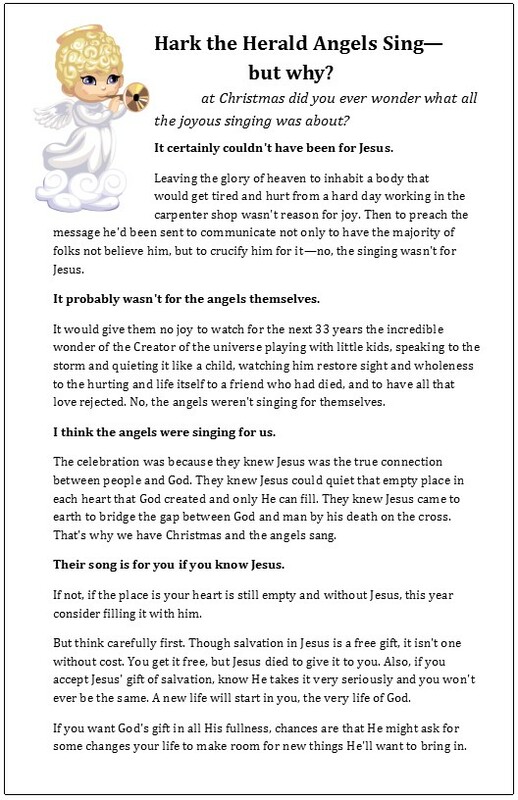 . .
During the holidays you heard that Jesus was the reason for the season. 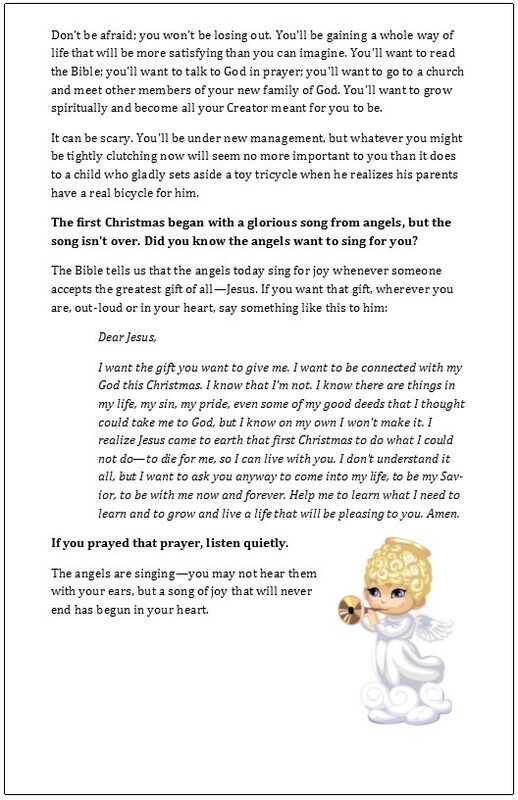 You heard stories, sang songs, and got Christmas cards—all about Him. 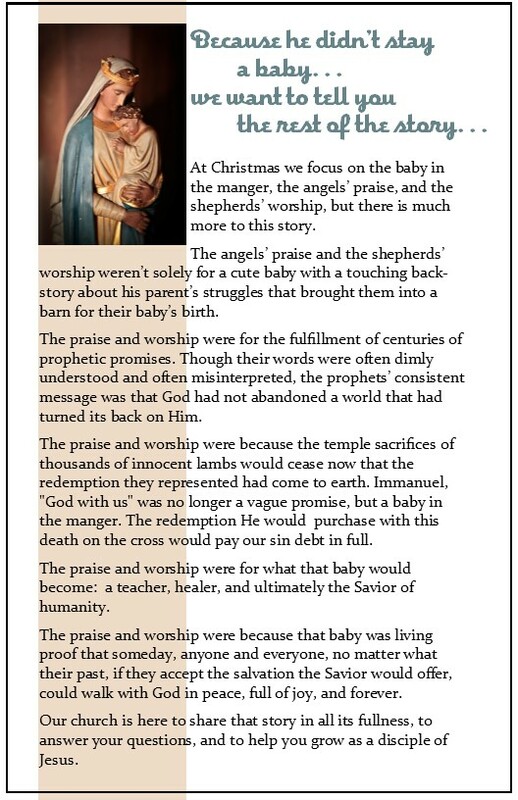 In the middle of all that, did you ever wonder, “What’s the big deal about Jesus?” What was there about this baby that split history in two and has the world celebrating his birth? Those are great questions and we’d love to discuss them with you. 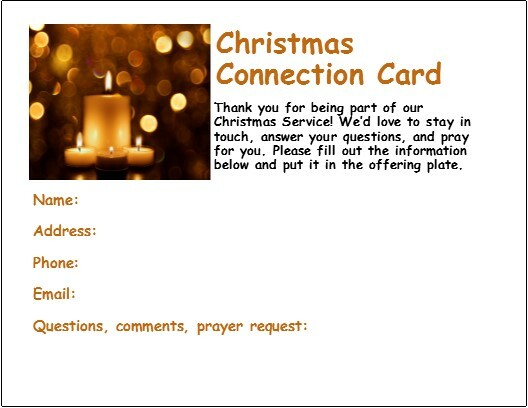 On the back of this card are some opportunities to explore this question and we hope you'll check them out. 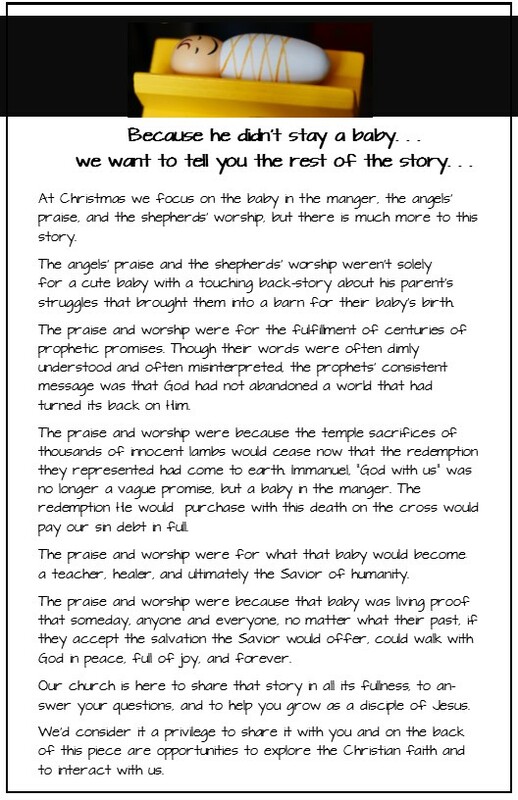 At Christmas, we focus on the baby in the manger, the angels’ praise, and the shepherds’ worship, but there is much more to this story. 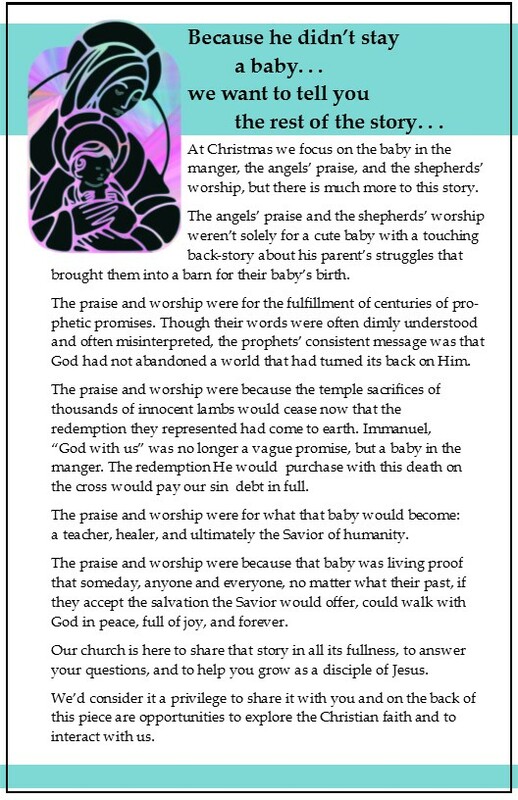 The angels’ praise and the shepherds’ worship weren’t solely for a cute baby with a touching back-story about his parent’s struggles that brought them into a barn for their baby’s birth. The praise and worship were for the fulfillment of centuries of prophetic promises. Though their words were often dimly understood and often misinterpreted, the prophets’ consistent message was that God had not abandoned a world that had turned its back on Him. The praise and worship were because the temple sacrifices of thousands of innocent lambs would cease now that the redemption they represented had come to earth. 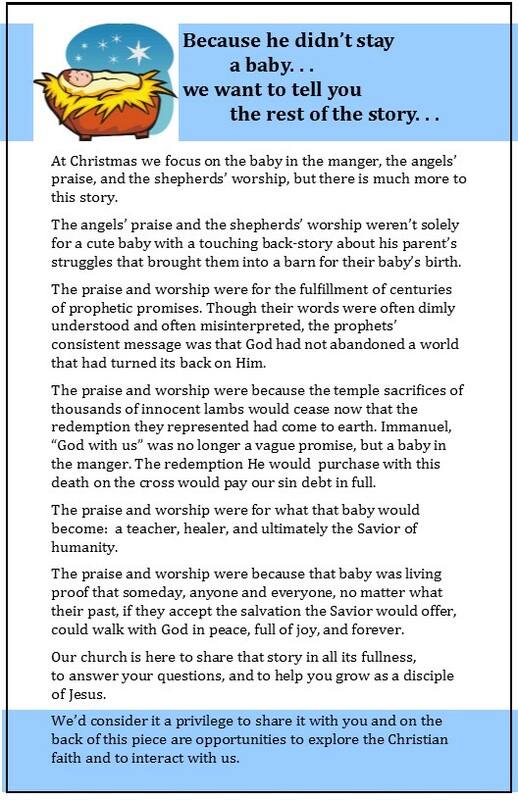 Immanuel, “God with us” was no longer a vague promise, but a baby in the manger. The redemption He would purchase with this death on the cross would pay our sin debt in full. 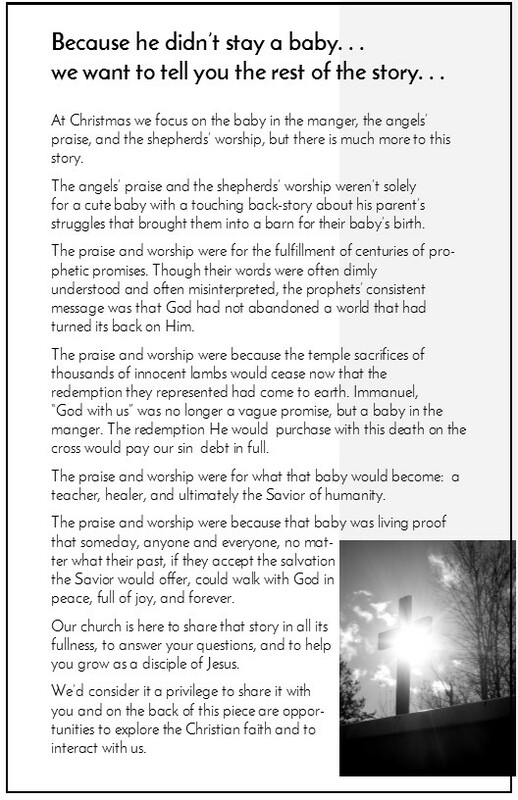 The praise and worship were for what that baby would become: a teacher, healer, and ultimately the Savior of humanity. 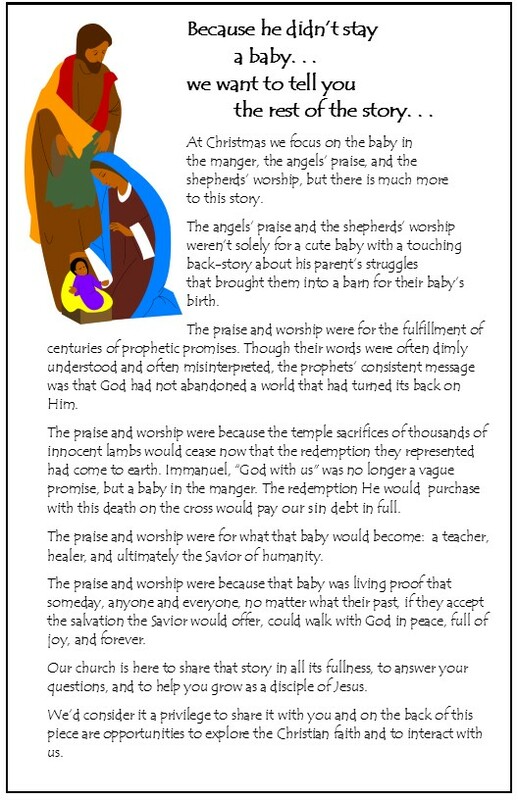 The praise and worship were because that baby was living proof that someday, anyone and everyone, no matter what their past, if they accept the salvation the Savior would offer, could walk with God in peace, full of joy, and forever. Our church is here to share that story in all its fullness, to answer your questions, and to help you grow as a disciple of Jesus. 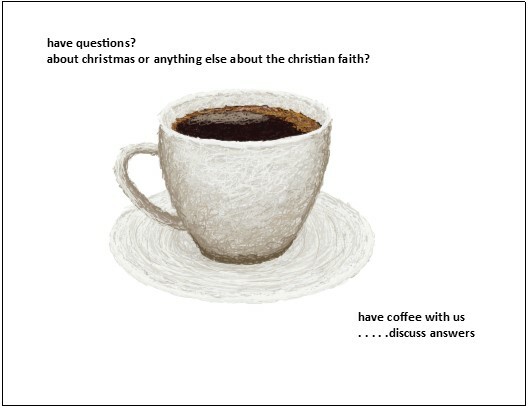 We’d consider it a privilege to share it with you and on the back of this piece are opportunities to explore the Christian faith and to interact with us. I'm so sorry to be just getting these to you now. 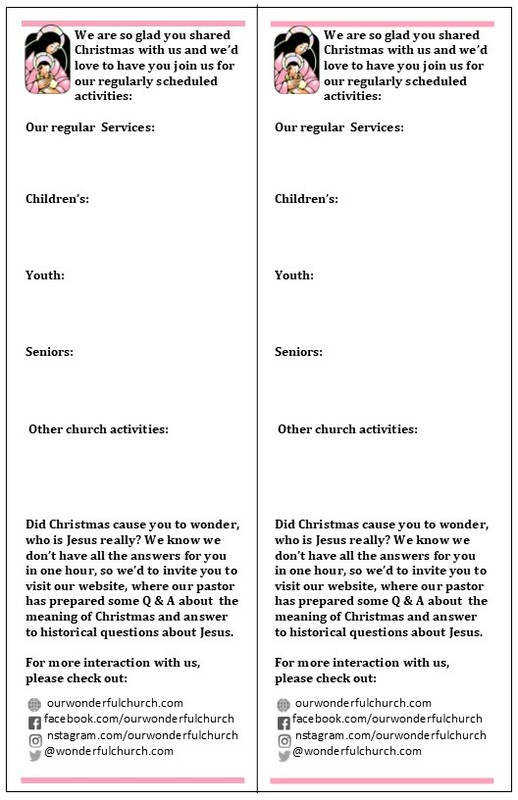 This is the list of the visitors at our Christmas Eve service. Oh my. I had no idea how to respond. 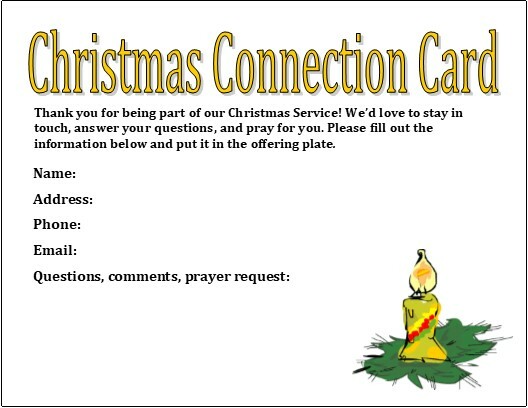 Hopefully, that will not be your situation and you know that you need to respond immediately to the connection cards you collected at your Christmas service. To help you do that, following are some you can make up ahead of time and have ready to send out. 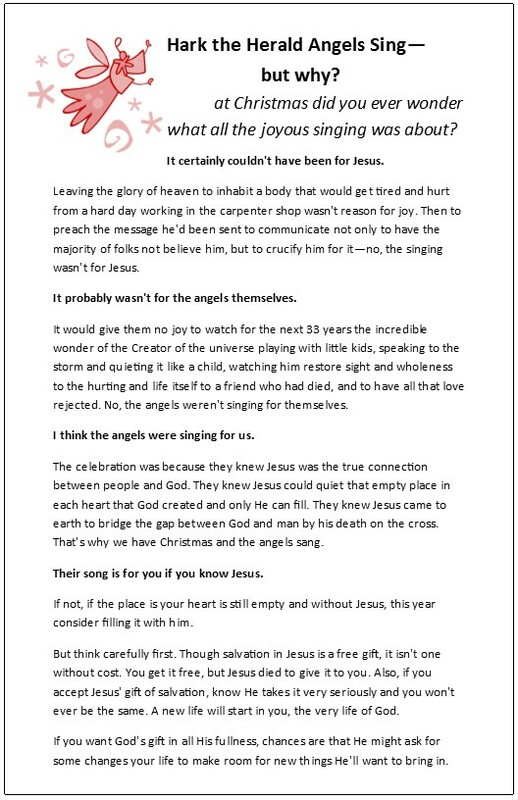 about christmas or anything else about the christian faith? After all the food, festivities, ho, ho, ho, and perhaps a church service thrown in, do you ever wonder why all the bother? It certainly doesn’t seem worth it for the commercial excesses all around us. But what if it was really about God becoming human? What if the ancient prophecies that God would be with us to show us what God was like and how to live in a way that pleases him were true? That would be worth celebrating. 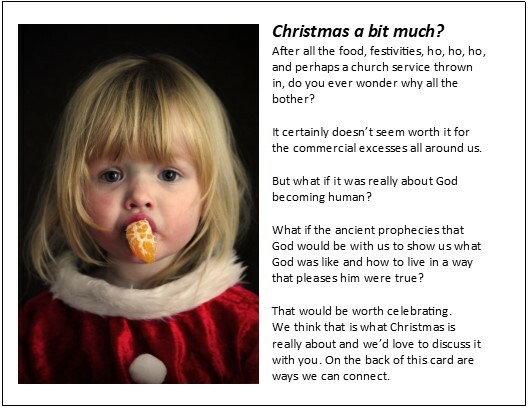 We think that is what Christmas is really about and we’d love to discuss it with you. On the back of this card are ways we can connect. 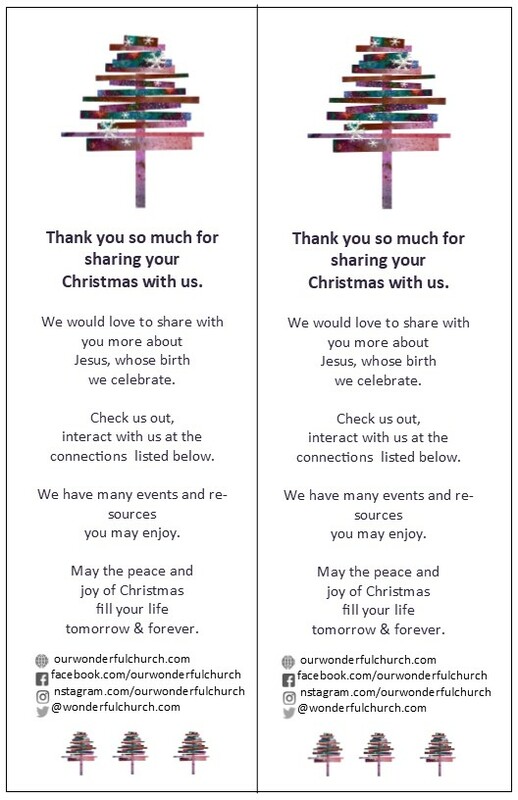 Many of you have already downloaded these communications, but if you haven't they are wonderful reminders that the purpose of Christmas is the salvation we find in Jesus. 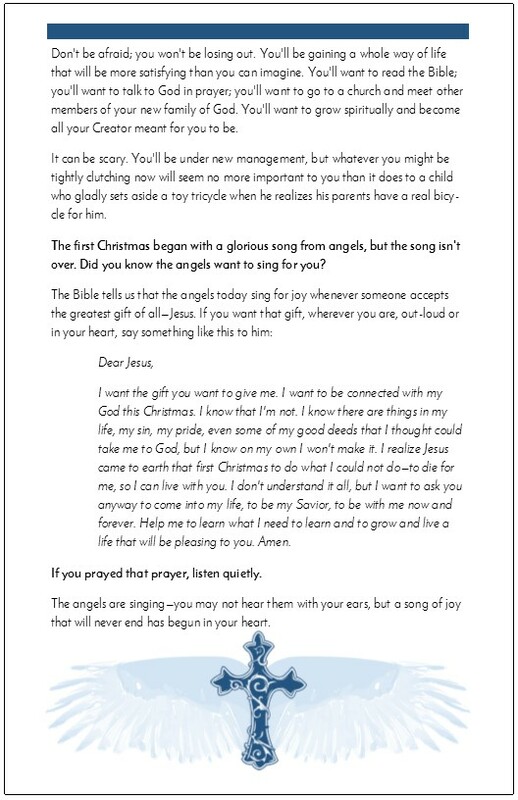 To remind people of it is a card or bulletin insert and a bulletin insert size version of "Hark the Herald Angels Sing, But Why?" 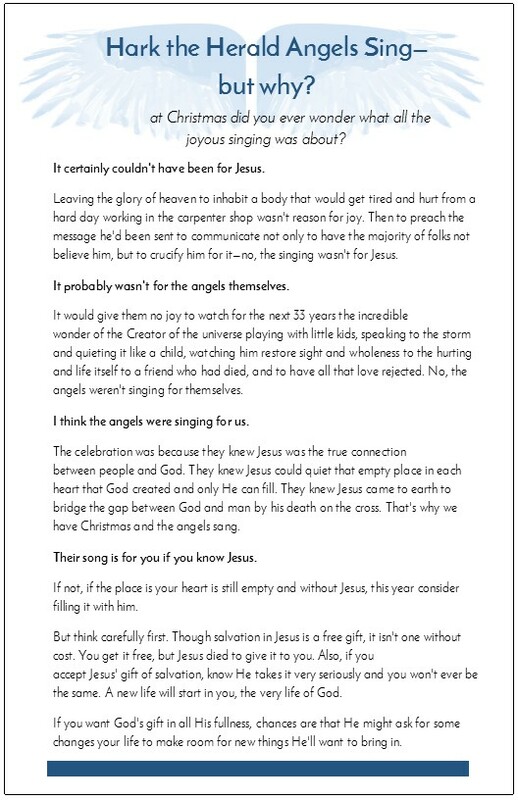 Our world needs to be reminded that Jesus truly is the "Reason for the Season." 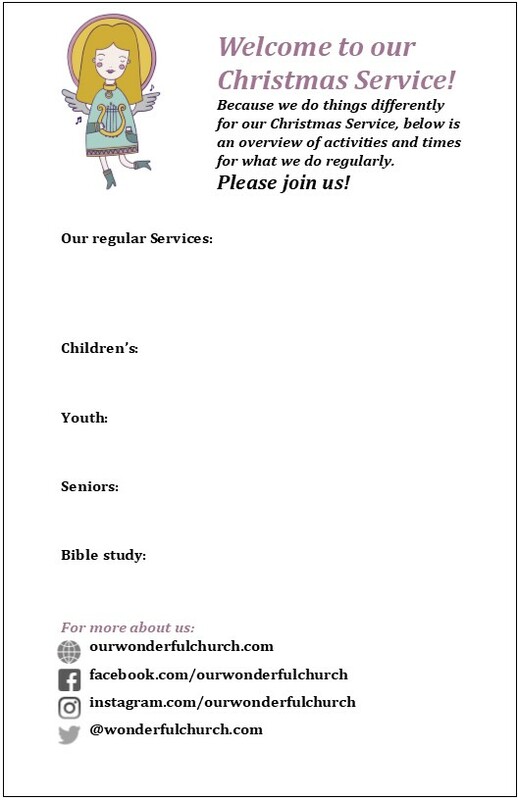 This flyer can help do that. 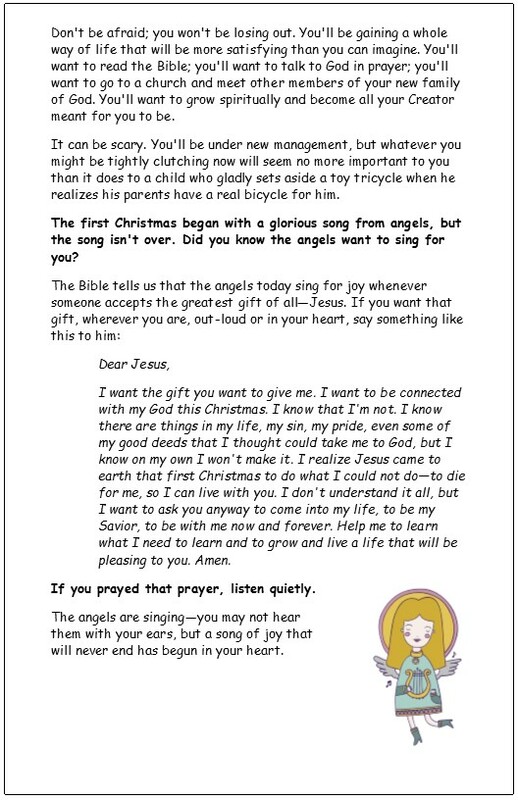 Bulletin insert size version of "Hark the Herald Angels Sing, But Why?"